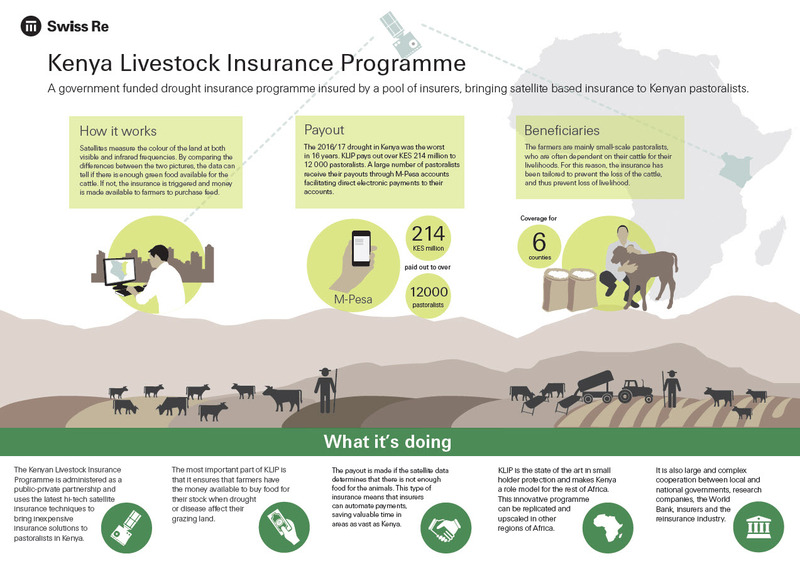 A $2 million insurance payout to thousands of livestock owners in Kenya hit by drought is a good example of insurance and technology coming together to deliver financial protection where it is needed most. The Kenya Livestock Insurance Program (KLIP), a public-private partnership developed by the government of Kenya and reinsured by Swiss Re, just announced the payout which averages around $170 per household and will be made by the end of February. KLIP uses satellite technology to measure vegetation available to livestock. Payment is triggered for feed, veterinary medicines and water trucks when the satellite data shows drought is so bad that animal lives are at risk. In this case, the $2 million payout will help save 70,000 tropical livestock – primarily cows, goats and camels – that in turn sustain approximately 100,000 people across six counties. Even better, a consortium of insurers led by APA Insurance will pay funds directly into the livestock owners’ bank accounts or via mobile phone accounts. The 2016/2017 drought in Kenya was one of the worst in 16 years. Between 2008 and 2011, livestock losses in Kenya accounted for 70 percent of the $12.1 billion in damages caused by drought. More on this story from Thomson Reuters Foundation. Insurance Information Institute facts and statistics on droughts and heatwaves are available here.